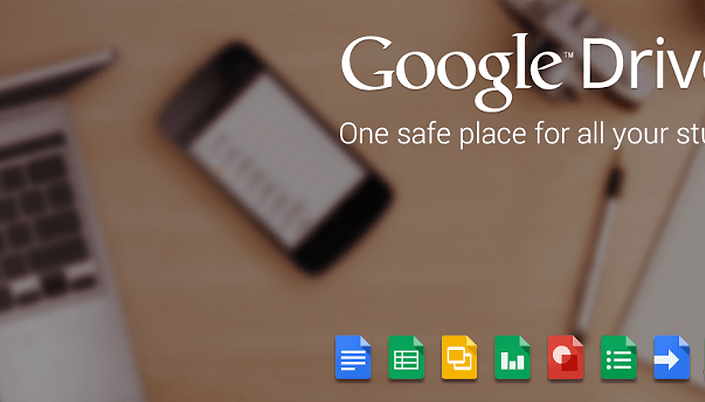 Google Drive - your Office in the cloud, as well as an app! When I started to write this app review, I had a sense of deja vu. Two years ago I reviewed Google Docs, and now, here's Google Drive, the Google service that takes all your office work into the cloud. Google Drive offers a full cloud service for working on the move with office functions for browser, mobile and tablet. In my opinion, a service with potential! What it can do, and how well implemented it all is into the app, you can find out in today's app test review! In these categories, all files are shown and can be sorted via various filters. You can also add new files or update existing files. In the context menu of a document there is a brief preview and you can move it, share with other people and make it available for offline access. All the same practical function familiar from the web version are available here. As you might expect, you can fully edit the entries in tables and text documents, and create new worksheets or edit the formatting. The latter works with the default options (font, formatting, font color), although other features, such as frame lines in tables, unfortunately, are not available. In addition to the text formatting options there are also opportunities to insert new rows and columns, as well as to arrange them alphabetically. It is also possible to add comments. As mentioned above, the Google Drive app allows you to create new files and folders and you can upload files from your smartphone. Another available option is scanning, or better yet said: photographing. So you just take a picture of a page and the app will adjust it (increase the contrast for better readability) and save it as a PDF file in the cloud. The Google Drive app uses the standard holo-design, which has proven to be very clear and intuitive. Via the action bar at the top you always have access to the main features of the app and of course the sidebar contains the main categories. Editing documents is also really easy, probably because there are only the most important editing functions available in Google Drive. In terms of speed you can not complain at all with Google Drive, even the download or upload of files is quick and simple, as is opening files. In addition, the app is very stable, at least it has stayed stable with me, hanging or crashing not once. Google Drive is free to download in the Play Store and contains no advertising - as one would expect from a Google provided service. Ultimately, I can say that the app has blossomed incredibly in the last two years. It is interesting to see how minor improvements that were necessary in Docs has become the completely overhauled and renamed Drive. The whole app has been redesigned and is now in the typical holo-style standard. Functionally, it has done much to make the editing of documents even easier and also the management of the other files has been further improved. Although compared to other cloud services it lacks a few features, this is simply because Google has tailored the service to editing the documents, something that many other services do not offer at all. Overall, Google Drive deserves a very good rating in my opinion, and there is not far to go to five stars! An extraordinary good app, especially when you have many pictures and documents you do not want to lose. And everything just with a free account. For cloud storage, I also use other services, the first one being DropBox, each of which has advantages and disadvantages, but Google Drive is the most effective for my business, because it allows me to have a collaboration between my colleagues and friends, and also I can edit the saved documents online. I was using Dropbox (there is not enough free space for me), Sugarsync (same like Dropbox, and for me slow). Now I am using new service - Copy. They will give you 15GB for free. I uninstalled Drive from all of my devices because it's glitchy. Wasn't searchable in Windows, then after hours of research, I fixed that problem, but then it wasn't synching properly. Dropbox has worked for me for years without a glitch. Used to love drive. But sharing the allowed 15gigs with Picasa AND Gmail, I'm left with no space. So it's unusable for me. Lame. I got a 50gig Dropbox for FREE. I would give 5 stars anyway!